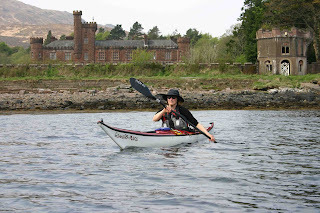 We didn't paddle out to the Small Isles, we took the ferry there and back. Why? We'd rather use the limited April weather window to explore the coastlines of two spectacular islands than flog ourselves across an open ocean. And anyway, we've done it before. 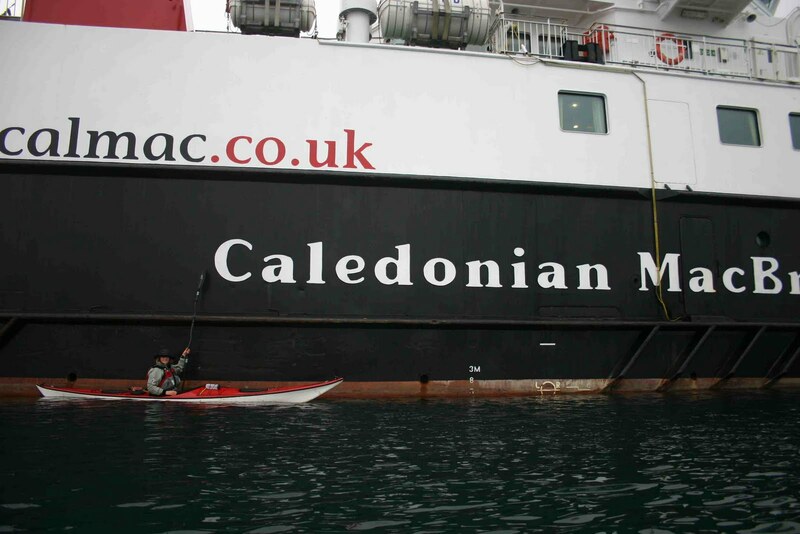 Last Wednesday we drove into Mallaig CalMac terminal at 09:15 for the 10:15 ferry, having telephoned to check there would be space. The Small Isles ferry is not like the busy car ferries on which we've previously carried kayaks. On those we recommend using a trolley. This time we knew few vehicles would be crowding onto the car deck, and as we'd rather not have the trolley wheels on our back decks, we decided to leave them behind. 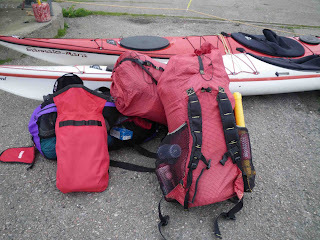 Instead, we loaded all our kit into two, red rucksacks, and one mesh bag, which we could carry on at the same time as the kayaks. Valuables went in the deck bag. The rucksacks, incidentally, are GoLite Gusts, the same ones we carried the length of the USA from Mexico to Canada, along the Pacific Crest Trail in 2002. They roll up to the size of a Ikea bag and easily stuff down past the skeg box into the tail. 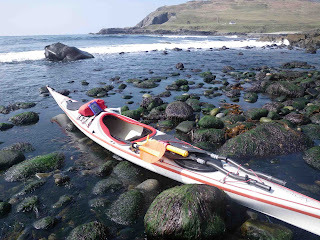 By 13:30 we had loaded up and were paddling away from Canna slipway to explore an amazing island. 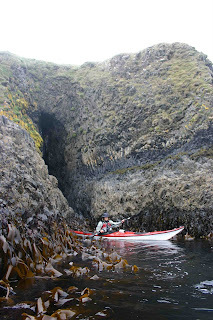 The contorted rock, like Staffa in miniature, left us awestruck at the forces which tortured and shaped this land. (See photos in slideshow below). Cliffs soared high above our heads, particularly at the western end, which I imagine is rarely visited on foot. Owned by the National Trust for Scotland, Canna is definitely an island to see from the sea, preferably from a sea kayak, although care is needed. us a bumpy few kilometres. There's a lovely cafe / restaurant on Canna offering good good albeit at city prices. We tucked into what we'd brought and studied the map, ready for tomorrow's crossing. The south going tidal stream in the Sound of Canna began running at 10:15, and we caught it just as it began. It gave us a smooth, gentle ride across to Rum, and we travelled at 7kph most of the way. Closer in to the island, swell once again bounced back off the rugged shore. Explosions of white marked the interface between sea and land, so for comfort we initially stayed further offshore. However, there was one place I wanted to visit for the first time in almost twenty years. Harris, a bay on the west of the island, is where Sir George Bullough wanted to build Kinloch Castle. With no safe anchorage, he was thwarted, so instead he built his family mausoleum. The first attempt was a marble and tile clad structure, and visiting reporter from The Times thought it "looked like a public lavatory". It was demolished with dynamite. If you look carefully at the hillside nearby you'll find part is still visible. (Photo in slideshow below). 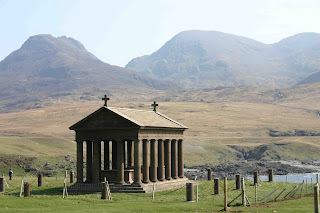 This mock Greek temple which serves as the last resting place for these members of the Bullough family was the replacement. It can be seen from the sea, and that's the easiest way as landing here is tricky. It is a boulder beach, and not all of those boulders are smooth. Launching an hour later was worse. The green slime covered rocks were treacherous and we couldn't carry our loaded kayaks across them. We had to unload, ferry all our kit to the water's edge in stages, re-pack, then launch. Indeed, lack of landing places is a feature of these two islands. Dibidil bothy (about which there is a book) is a lovely spot to spend the night when you've hiked the Rum Cuillin. But once again, the shore is guarded by boulders. With no swell, a step-ashore landing would be possible. Otherwise I'd want a plastic boat, or one with a keel strip. We found a sandy beach that's not marked as such on the OS maps, right beside a standing stone. This was the site of a ruined settlement, and made a lovely second camp. Friday morning started slowly. We initially headed north, but decided to head to Kinloch Castle and take the tour. We stayed at the castle exactly ten years ago for Liz's birthday, so it was nice to return and see how little has changed. Crowds of people were arriving for the Easter holiday. 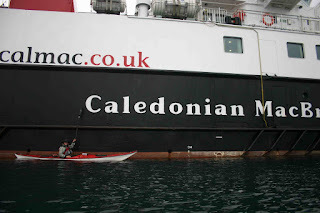 If we'd had more food, we could easily have crossed to Eigg, where we've previously camped, then to Arisaig and back to Mallaig, all trips we've done in the past. But we only had supplies for the intended days away, no chance to re-supply on a holiday weekend. Also rain was forecast and work was calling.